In this post, you will find the Australian laws for the use of drones. Maximum altitude: In controlled airspace, you can not fly higher than 120 meters (400 feet). Maximum horizontal distance and FPV: Drones always have to be flown in sight. Operation in fog or clouds is not allowed. Compulsory insurance: To my knowledge, only commercial pilots have to insure their multicopters. But we recommend every operator to cover drone flights. Maximum take-off weight (MTOW): Private drones are considered as model airplanes up to a weight of 150 kilograms. From 25 kilograms special permits are necessary. Distance to airports: A distance of 5.5 kilometers to airports, airfields, and heliports is required. Other safety distances: To persons, boats, and buildings must be kept 30 meters distance. No-fly zones: Flying over busy areas like beaches, busy parks or sports facilities is not allowed. Also not permitted are climbs in Uluru Kata Tjuta National Park (Ayers-Rock). Even in other national parks, the number of prohibitions is increasing. I, therefore, recommend that you consult the rangers in advance when you intend to fly in a national park. Here you find a map with further no-fly zones in Australia. Operating times: flights at night are not permitted. Requirements for commercial pilots: As long as your drone weighs no more than 2 kilograms, the bureaucratic effort is limited. In this case, you first need a personal Aviation Reference Number (ARN), which can take up to five business days to deliver. Then you fill out an online form in which you agree to comply with the Standard Operating Conditions (SOC). The SOCs comply with the regulations for private model airplanes. If you also want to make maneuvers or have a heavier drone, you will need a Remote Pilot License (RePL) and/or an RPA Operator’s Certificate (ReOC). 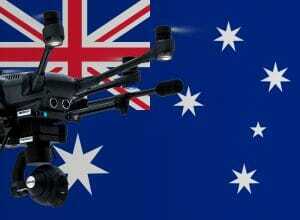 We have researched the listed drone regulations for Australia to the best of our knowledge. We cannot guarantee the correctness of the information. If you want to be on the safe side, contact the competent aviation authority. Alternatively, you can also ask the embassy in your country for further information about the regulations. Please leave us a comment when you receive news and/or gain experience with your copter in Australia! Im bringing DJI Spark with 2 extra batt. Do i need any documentation clearance from Perth Airport customs. No, as far as I know, you don’t need a clearance from the customs as long as you bring the drone for your amusement to the country. Planning to use dji Mavic air in Sydney and Melbourne? Do I still need a license for me to operate it?